China’s remarkable economic rise over the past three decades has yielded many benefits to its own citizens and to people all around the globe. But the export-led growth model that underpinned China’s success and its increased role in the global economy has also led over time to the development of some serious imbalances in its economy. How China deals with these imbalances will have important implications for the rest of the world going forward—in particular, the quantitative analysis reported here suggests that were China to experience a financial crisis, the hit to the rest of the world would be substantial. China’s economic rise over the past three decades has been meteoric. But the export-led growth model that authorities there have pursued appears to be reaching its natural limits and has also created significant imbalances in the economy. China’s economy now stands at a critical juncture, and the direction it takes will have important implications not just for China itself but for the global economy at large. It seems an opportune time, therefore, to study in detail China’s footprint on the global economy. In this note, I discuss some key aspects of China’s economic rise and spillovers to the rest of the world this rise has created. I then examine how China’s economy is changing and how these changes are altering its influence on other economies. Finally, using the Federal Reserve’s large-scale model of the global economy, I empirically investigate the potential consequences for the global economy if China’s economy were to experience a sharp and persistent slowdown. A crisis situation in China is not the most likely scenario given mitigating factors. However, if China were to experience a financial crisis, the results presented here suggest that the adverse consequences for the rest of the world would be substantial. But there are things that Chinese authorities can do as preventive measures to reduce the country’s vulnerabilities. China’s economic performance has been remarkable. For about 30 years before the start of the current decade, Chinese real GDP growth averaged 10 percent (Figure 1). Lately, growth has slowed significantly, but is still quite high relative to most economies. The strong performance substantially increased per capita consumption and helped vastly improve standards of living and take many millions of Chinese people out of poverty. China’s rise was achieved largely by using its cheap and large labor supply to expand the economy’s manufacturing base and play an ever-increasing role in meeting the world’s external demand. Strong exports, supported by export-led investment, underpinned Chinese growth (Figure 2), although the high correlation between the growth of exports and investment weakened during the Global Financial Crisis (GFC). China’s growth model was also based on export processing zones, industrial policies that gave preferential tax treatments to exporters, and—to some extent—an undervalued currency (with an accompanying massive foreign exchange reserves accumulation). A key channel through which China has affected other economies in the region is through its role as a conduit—the endpoint of a giant Asian supply chain. 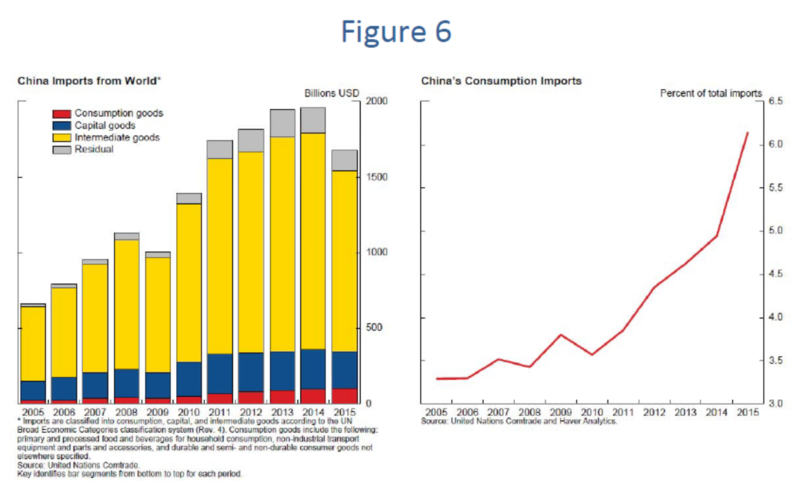 China’s share of parts and components in its total manufactured imports (shown by the yellow bars on the left in Figure 3) rose between 1995 and 2005 and has been much higher than its share of parts and components in its total manufactured exports (shown in the right panel). These properties are consistent with China's being an endpoint of a large global value chain and shipping mostly final goods abroad. The conduit role, of course, ultimately depends on the final demand that comes from other countries. The rest of Asia has played an important role in partnering with China in the process of “production fragmentation.” The share of parts and components in China’s imports from other Asian economies (the green bars on the left) is significantly higher than in imports from the rest of the world (the blue bars). Japan, Malaysia, the Philippines, Singapore, South Korea, Thailand, Vietnam, and Other Asia. Key identifies bar segments from left to right within each period. China has also boosted commodity net-exporters around the world through its voracious demand for various commodities. China now accounts for more than 10 percent of the global demand for oil and about half of the world’s demand for steel, coal, and copper (Figure 4). China’ rise has had much broader ramifications beyond its influence on lifting other emerging market economies (EMEs) and commodity exporters. Increased production fragmentation is a natural outgrowth of the principle of comparative advantage. This process, in which China has played a special role, efficiently made available a larger variety of goods to consumers at lower prices all over the world, thus also benefiting the advanced economies, which are the biggest demanders of consumer goods. China and its influence on the global economy has changed in recent years. One clear trend over the past several years is the decline in the import content of Chinese exports. “Nonprocessing” exports, which have a larger share of inputs that are domestically sourced relative to “processing” exports, have seen their share of total exports (the black line in Figure 5) increase to more than 65 percent from about 50 percent a decade ago (See Note 2). We can see the reduced role of processing trade on the import side as well, with the red line showing that three-quarters of imports now are nonprocessing imports. To a large extent, this reduced role reflects that more domestically-sourced inputs are being used in the export goods being produced. 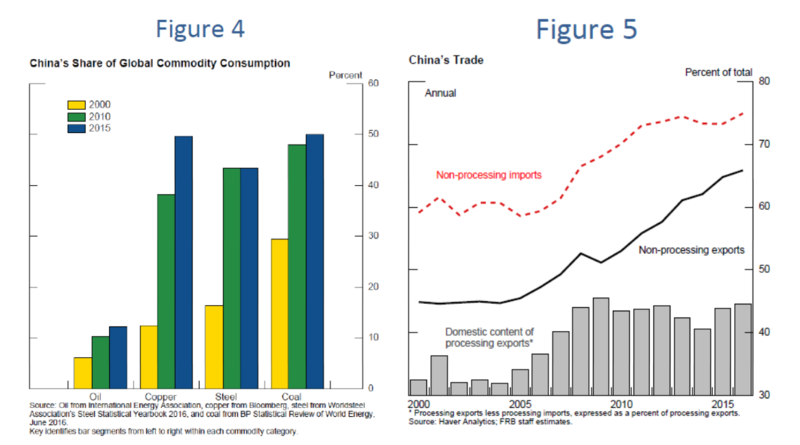 Indeed, as shown in the gray bars in the slide, even “processing” exports now have more domestic value-added with relatively less contribution from imported inputs than before. Another possibility is that goods are being increasingly imported for domestic use and consumption rather than largely just channeling final demand from other economies. What evidence do we have of the rising role of Chinese consumers in global demand? The value of Chinese consumption imports (the red portions of the bars in Figure 6) are barely visible until the turn of the decade. Nonetheless, they have been rising since then, and the share of consumption goods in total Chinese imports (shown to the right), while still quite low at about 6 percent, has nearly doubled since 2010. And, on the services side, particularly in Chinese spending on tourism, we see stronger evidence of demand for consumption imports. Wong (2017) has quantified the amount of travel imports in China that are disguised-capital outflows. But even adjusting for this distortion, as shown in Figure 7, China’s share of global tourism has increased sharply in recent years to about one-fifth. All in all, even though the Chinese consumer is far from being a notable independent engine of global demand, looking forward, there are some grounds to be cautiously optimistic on this front. China’s rise is reflected in it’s becoming a much bigger player in the global economy as reflected in its share in global trade sharply trending upwards since the early 2000s and reaching double-digit levels earlier in this decade, before falling back a bit recently (See Note 3). In addition, over the past two decades, China’s share of world GDP has risen markedly. China, by itself, now accounts for almost 20 percent of world GDP, using purchasing power parity weights that the IMF reports, while the EMEs together now account for over half of world GDP. But, while the export-led growth model served China well for decades, it has also over time created some serious imbalances. First, China’s ballooning current account surplus contributed to the large global imbalances that developed in the years prior to the GFC. Exports far outpaced imports, as reflected in savings’ growing even faster than investment, and a large current account surplus built up (Figure 8). High savings have prevented Chinese consumers from fully benefiting from China’s rise, and China’s share of consumption in GDP remains below many of its peers. Chinese external balances have narrowed substantially post-GFC and greater flexibility of the exchange rate has played a key role, but the narrowing is, in part, also due to cyclical factors. The second imbalance is overinvestment and excess capacity in certain sectors. In the aftermath of the GFC, a massive stimulus package led to a surge in investment, notably in infrastructure and manufacturing (Figure 9). This surge contributed to a subsequent property boom and resulted in excess capacity problems in segments of real estate markets and certain manufacturing sectors, such as steel. The investment was largely financed by a massive credit boom, which created imbalances and vulnerabilities in the financial sector. Total credit-to-GDP ratio (the black line in Figure 10) climbed sharply from about 120 percent before the GFC to nearly 230 percent last year. This credit boom has been fueled increasingly by nontraditional lending (or “shadow banking”), the majority of which is still intermediated by banks but is mostly accomplished through off-balance-sheet activities to avoid regulatory restrictions (See Note 4). These developments leave banks highly exposed to the vulnerable property and nonfinancial corporate sectors and with concerns about asset quality and moral hazard. China is also facing the longer-term challenge of a downward trend in its potential economic growth. To some extent, this slowing is a natural result of the process of “convergence”; economies tend to slow as they develop, and a slowing on that count should be viewed as a measure of success rather than of failure. But there are also other reasons for the slowing of trend growth in China. In particular, China faces headwinds from demographic changes, given that its working-age population has peaked and a rapid growth of its elderly population is projected. This source of slowing growth has the potential to threaten social welfare. While financial-sector vulnerabilities have become acute and are accompanied by downward trending potential growth, several special features of China mitigate the risks of a full-blown financial crisis. 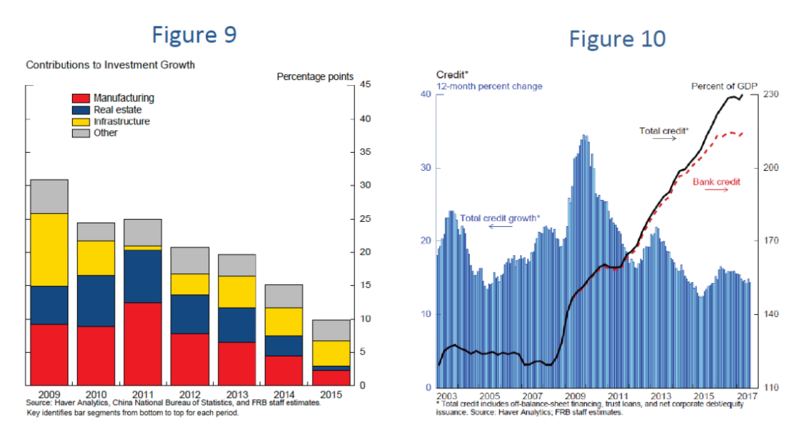 First, China’s credit boom has been funded largely by domestic savings. Second, China has a less market-oriented financial system, which, although inefficient and distortionary, also lessens the risk of credit’s drying up, as authorities can simply compel financial institutions to lend. Third, even as economic growth has slowed by Chinese historical standards, it is still quite robust. Finally, Chinese authorities have substantial resources to rescue any troubled debtors and bail out banks. But these mitigating factors, by themselves, do not address the inherent vulnerabilities and imbalances in China’s economy. Some possibility remains that certain types of shocks—such as a property-sector bust, a run on some shadow-banking products, or a sharp, disruptive depreciation of the renminbi—could snowball into something much bigger and precipitate a financial crisis. As such, China is walking a fine line between addressing the imbalances that have developed and preventing growth from slowing too much; missteps could occur. If China were to experience a financial crisis with an abrupt and persistent slowing of economic growth much below trend, what effect would that have on the rest of the world? In answering this question, one key factor to consider is that other EMEs are now much more directly vulnerable to changes in Chinese economic growth. One way to see this is through estimating a simple three-variable vector-autoregression (VAR) model consisting of advanced-economy real GDP growth, China’s real GDP growth, and other EMEs’ aggregate real GDP growth. To identify shocks to each variable, I assume a contemporaneous, recursive, causal ordering running from advanced-economy real GDP to Chinese real GDP to real GDP of other EMEs (See Note 5). As shown in the top panels of Figure 11, in this setup, over the full sample period, a 3 percent real GDP shock to China affects other EMEs by about one-third of China’s own cumulative output response (See Note 6). 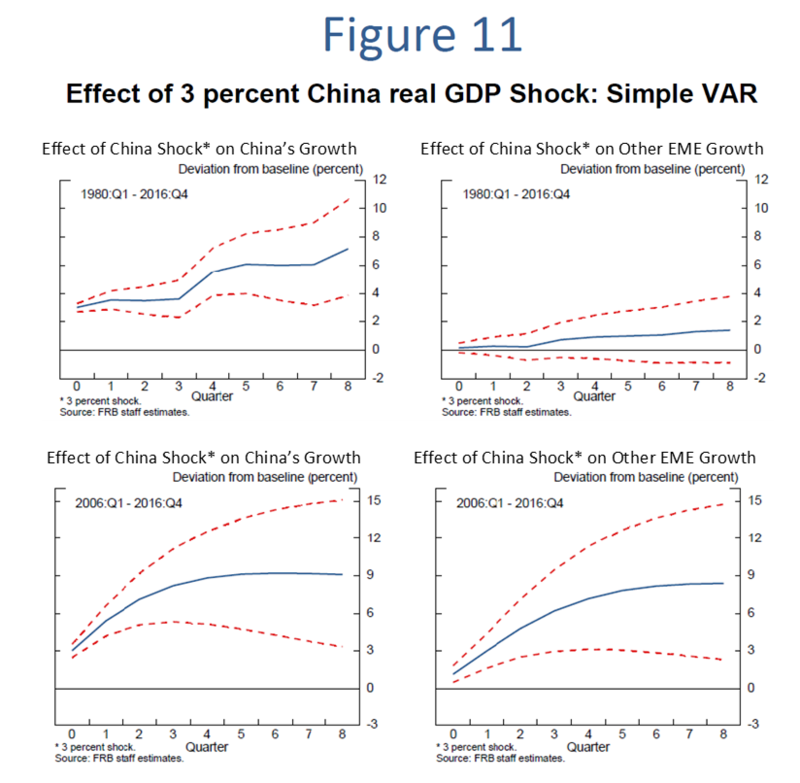 Note that this exogenous shock is meant to capture the independent direct effect of China’s growth on other EMEs, keeping fixed the indirect effects of advanced-economy demand. For the period since 2006, shown in the bottom panels, the results are vastly different, with a Chinese GDP shock affecting other EMEs close to one-to-one. These results suggest a large increase in direct spillovers from China to other EMEs in recent years. With these results in mind, I will now use the Federal Reserve Board staff’s global model, SIGMA, to quantify the effects of an adverse China growth shock on the rest of the world. SIGMA is an open economy, general equilibrium model. Monetary policy typically follows a Taylor rule, subject to a zero-lower-bound (ZLB) constraint. The model consists of three blocks: the U.S. economy, advanced foreign economies (or AFEs), and the EMEs (See Note 7). To quantify the effects of a Chinese slowdown through this model, we need to know its effect on other EMEs given that the model has only an aggregate EME block. Using the VAR evidence, which suggested the response of other EMEs to China shocks has gone up in recent years relative to the one third response over the full sample period, we assume “standard” spillovers from China to other EMEs (mainly through trade channels), to be half the China response. But we also consider a situation of “extra” spillovers in which the response of other EMEs to China is one-to-one, which is consistent with the VAR evidence from more recent years. All in all, we quantify the effects in our SIGMA model of three China scenarios: 1) a moderate China slowdown with “standard trade” spillovers leading to other EMEs GDP response being half of China’s own GDP response; 2) a China crisis situation but with still standard spillovers of one-half to other EMEs; and 3) a China crisis with “extra financial” spillovers due to financial turbulence in China’s spilling over to world financial markets and leading to the other EMEs’ response being one-to-one. It is not obvious exactly how much Chinese growth would decline in a crisis. We assume a crisis situation to be one in which annualized growth falls 4 to 5 percentage points below trend growth for some time. This translates roughly into the level of real GDP about 7 percent below baseline over a period of a year and a half (the solid blue and dashed red lines in panel A of Figure 12). We judge a moderate Chinese economic slowdown to be about half of this decline (the dotted green line). 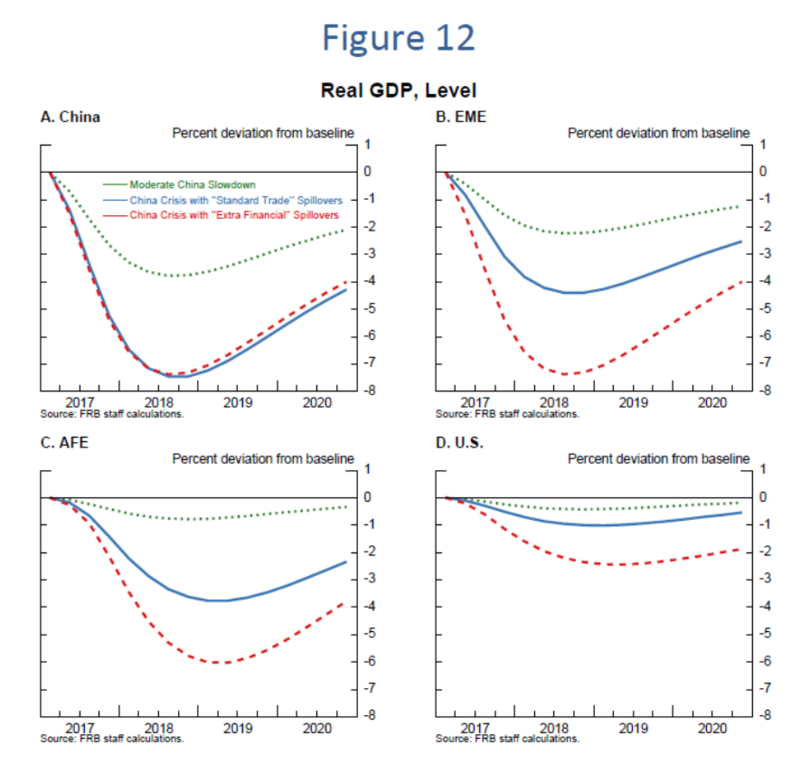 Now consider the broader effects across the world, shown in panels B through D. First, note from the dotted green lines that a moderate slowdown in China, while adversely affecting aggregate EME real GDP to a significant extent, would not appear to be too problematic for the AFEs and the United States. But if China went into a crisis, the effects around the globe would be substantial even with just the standard trade spillovers (the blue lines). With other EMEs hit hard, aggregate EMEs would drop 4 percent below the baseline, roughly equivalent to what transpired in the 1994–95 Mexican crisis. Note that the AFEs, with limited scope for monetary policy to respond due to their policy rates still being at the model’s zero lower-bound, would also suffer a sizable real GDP drop of 3 percent. The United States appears relatively insulated, given that there is more room for responding with monetary policy easing, but U.S. GDP still falls a significant 1 percent. Things could be significantly worse if financial turmoil in China caused reverberations in other financial markets around the world. As illustrated by the dashed red lines, aggregate EME GDP would drop 7 percent (about equivalent to the 1997–98 Asian crisis); AFE GDP would drop about 6 percent; and U.S. GDP would drop 2 percent, close to one-third of the EME response. According to these results, the spillovers to advanced economies as a whole from a Chinese crisis would be bigger than those observed in previous EME crises. One obvious reason for the bigger response is a higher share of China and other EMEs now represented in global GDP and trade. But another less obvious but important reason is the limited ability of monetary policy to respond appropriately in many advanced economies. The hit to the U.S. is smaller than the hit to other advanced economies partly because the ZLB is no longer a binding constraint for the U.S.; this allows monetary policy to respond more appropriately to the adverse shock (See Note 8). All in all, a financial crisis in China with an accompanying sharp slowing of economic growth in the country, would be quite consequential for the global economy, especially if this crisis roils global financial markets. Therefore, it is in China’s own interests, in addition to those of the global economy, to take forceful measures to address its vulnerabilities over time, while simultaneously attempting to keep economic growth robust. What measures can China take to reduce the imbalances in its economy without derailing growth? I suggest some desirable policy measures (See Note 9). 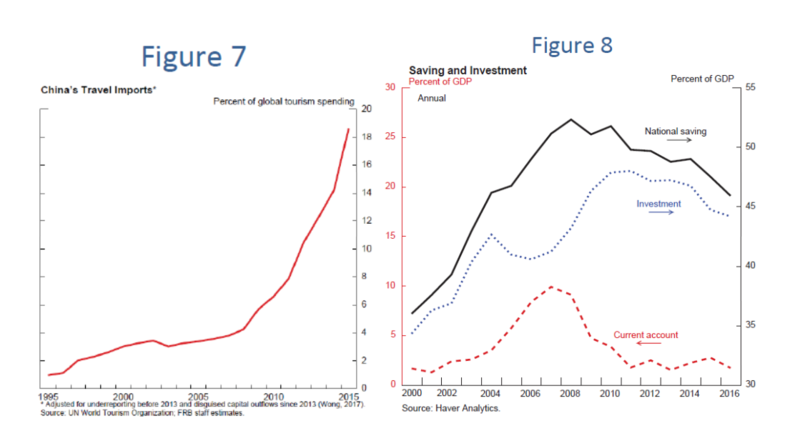 First, policies to reduce China's high savings rate need to be accelerated. Increased government spending on health and social security would reduce the need for precautionary household savings. Business savings could be reduced through increased dividend payouts by state-owned enterprises (SOEs) and using these dividends to finance social security expenditures. Second, fiscal policies need to become less oriented toward stimulating investment. The excessive investment orientation of Chinese stabilization policies is partly the result of China’s reliance on the banking system to provide stimulus. Accelerating the liberalization of the financial sector to reduce reliance on bank financing would be helpful. Third, more can be done to reinvigorate the private sector as an engine of growth, including hastening the pace and broadening the scope of SOE reforms to gradually remove implicit public guarantees and allow nonviable SOEs to shut down. Finally, Chinese authorities should continue to increase the flexibility of the exchange rate, thereby benefiting more fully from its role as an equilibrating mechanism. Note 1: The author is Associate Director in the International Finance Division, Board of Governors of the Federal Reserve System, Washington DC 20551 U.S.A. He can be reached at shaghil.ahmed@frb.gov. This note is based on remarks that were delivered by the author at the Second International Monetary Fund and Federal Reserve Bank of Atlanta Research Workshop on the Chinese Economy in Atlanta, GA, in May 2017: https://www.federalreserve.gov/econres/notes/ifdp-notes/chinas-footprints-on-the-global-economy-20170928.htm. The author would like to thank for their assistance and input Mandy Bowers, Daniel Dias, Neil Ericsson, Jasper Hoek, Jessica Liu, Michael Navarrete, Albert Queralto, Andrea Raffo, Bekah Richards, Ellen Wiencek, Anna Wong, and especially, Zach Sauers. The views expressed are solely the responsibility of the author and should not be interpreted as reflecting the views of the Board of Governors of the Federal Reserve System or of any other person associated with the Federal Reserve System. Note2: Processing exports are those exports that primarily use imported parts and components to assemble or process final goods for export. The division into “processing” and “nonprocessing” exports is based on categories in Chinese customs data. It is not a perfect delineation in that nonprocessing exports also have some domestic input content, just not as much as processing exports. Note 3: See Lewis and Monarch (2016) and Powell (2016) for an analysis of the recent fall in global trade and China’s role in that decline. Note 4: Although shadow banking has now become an area of concern, it has played some positive roles as well—for example, in the provision of credit to small-and-medium enterprises and alternative investments for diversification-constrained retail investors. Note 5: This is a standard Cholesky decomposition identification scheme for a VAR, in which the contemporaneous interactions between the variables in the VAR are assumed to be recursive. The recursive nature of the model applies to only the contemporaneous interactions; all variables are allowed to affect each other with a lag. Note 6: A much larger global vector autoregression (GVAR) yields similar results. See Ericsson, Husted, and Seymour (2014). Note 7: The word “foreign” here is meant to convey foreign economies defined from the perspective of the United States. Note 8: The model does not take into account that policymakers in other advanced economies can respond to some extent with unconventional monetary policies, such as further asset purchases. Note 9: One interesting report discussing China’s policy options is OECD (2017). Ericsson, Neil, Lucas F. Husted, and J.E. Seymour (2014). “Potential Spillovers from a Sudden Sizable Slowdown in Chinese Growth (Washington: Board of Governors of the Federal Reserve System, June, manuscript). Lewis, Logan and Ryan Monarch (2016). “Causes of the Global Trade Slowdown,” IFDP Notes (Washington: Board of Governors of the Federal Reserve System, November), https://www.federalreserve.gov/econresdata/notes/ifdp-notes/2016/files/causes-of-the-global-trade-slowdown-20161110.pdf. OECD, (2017). “OECD Economic Surveys: China 2017,” (Paris: OECD Publishing, March), http://www.oecd-ilibrary.org/economics/oecd-economic-surveys-china_20725027. Powell, Jerome H. (2016). “The Global Trade Slowdown and Its Implications for Emerging Asia,” Remarks delivered at the Federal Reserve Bank of San Francisco 2016 Pacific Basin Research Conference (Washington: Board of Governors of the Federal Reserve System, November), https://www.federalreserve.gov/newsevents/speech/powell20161118a.htm. Wong, Anna (2017). “China’s Current Account: External Rebalancing or Capital Flight?” IFDP, No. 1208 (Washington: Board of Governors of the Federal Reserve System, November), https://www.federalreserve.gov/econres/ifdp/files/ifdp1208.pdf.